Monthly Design Challenges for 2017-18 can be found on our Programs at a Glance page under our “Programs” button. What is Design? Design is the plan that brings order to any art form. Light: the illumination necessary for vision. Light effects designs so that colors are changed, textures enriched, shadows, drama and mood develop. Line: One-dimensional visual path through design. Line establishes a structural framework for design, line carries the rhythm through design and creates mood. There are two techniques for creating line. Actual line is the line created using materials like branches or vines, or stems. Implied lines are created through repetition of color, forms, sizes, textures, and color in a linear pattern. Lines can be vertical – uplifting, inspirational. Or they can be horizontal – restful, quiet. Thin lines are less forceful than heavy lines – curving upward they appear alive; curving downward seem sad. Zigzag lines seem restless. Form: A three dimensional object using basic geometric forms like sphere, cube, cylinder, pyramid and cone. Forms can be open or closed. Elements such as flower, texture, size and color impact form. Color: The characteristic of light by which an individual perceives objects. Pattern – the design formed by solids and spaces between them. Texture: the surface quality of a material. Texture modifies color. It provides harmony and contrast. Size: Apparent or visual dimension rather than actual dimension. This is where we address scale and proportion. Size is affected by distance from viewer, size of other components of a design. And color and texture will affect size. Balance – visual stability and the placement of equal weight on opposite sides of an imaginary central axis. Balance relates to the force of gravity. In design, we may choose symmetrical, asymmetrical balance or dynamic balance used in creative designs. Dominance – the greater impact within each of the elements. Implies subordination. Contrast – achieved by placing opposite or unlike characteristics of a single element together in order to emphasize their differences. Rhythm – created by dominant visual path through a design. Rhythm suggests motion by both repetition and gradation. Proportion – the comparative relationship of areas and amounts – the volume of plant material and how your eye travels through design. Scale – the size relationship of one object in a design compared to another. Want to learn more: Go to an NGC (National Garden Clubs, Inc.) Flower Show School! Not a garden club member but want to go to Flower Show School? Join a NGC garden club! 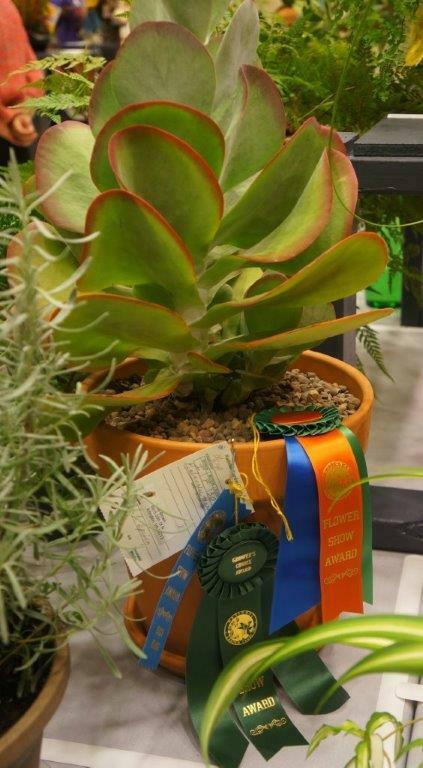 National Capital Area Garden Clubs, Inc. recently hosted an award winning state flower show in October 2014 – several members of our Club submitted designs AND horticulture exhibits. Those members won several first, second, third and honorable mention ribbons.